This note is posted on behalf of Eymund. a: are Prospect Park artesian springs really there ? b: are these natural spring outflows currently connected to Prospect Parks internal drainage system, or are they (whoops !) connected to the Park Slope combined sewage system flowing down to the Gowanus? It should be noted that the new DEP administrator Emily Lloyd was formerly Prospect Park's president and would be keenly interested in anything involving City Park solutions to the $78 million DEP is currently required to spend to solve Gowanus sewer overflow problems. This is a test research map by Eymund Diegel combining hydrological runoff data from modern digital elevation models (2004 DEM and 2010 LIDAR topographic models) with historical military survey maps. (the 1915 Stevens edition of the 1782 British Headquarters Military Survey Map). By combining these two data sets, and cross referencing them with modern sewer maps, valuable insights can be obtained to help solve road flooding and sewer backup problems. Old stream lines on this map coincide with many of the calls to the City's 311 call system for flooding and sewer backup complaints. 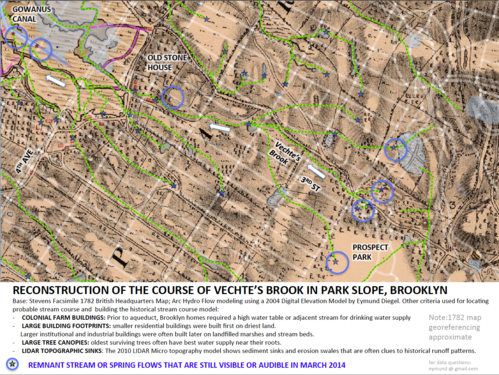 Follow up field research in March 2014 established that natural springs along Prospect Park West may currently be flowing into Park Slope's combined sewer pipe system. As part of the 2013 Gowanus Canal Superfund Cleanup Plan, New York City is been ordered by the United States Environmental Protection Agency to spend 78 million dollars to find solutions to combined sewer overflows into the Gowanus Canal. Currently two sewer holding tanks have been proposed. This ongoing research explores more sustainable alternatives and discussion about the currently proposed combined sewer tanks that would be built in the flood zone. One alternative is to better understand where water was historically stored in the upslope landscape - the watershed's ponds and wetlands. Many of these damp sites, because they were unsuitable for housing ended up as City properties: small parks and playgrounds, and later schools or public housing. It shows the original springs of Prospect Park prior to regrading under the Olmstead & Vaux landscaping plan. Kite mapping of current grass growth patterns and surviving spring upwellings would try to give a higher resolution understanding of how the Park's hydrology has changed over time. If it turns out the springs were diverted and drained into the Prospect Park West combined sewer system, these clean water springs would be (unnecessarily) contributing to combined sewer overflows in the Gowanus Canal Superfund Site. Such a discovery would allow a discussion to begin about the restoration of the historical wetlands of Prospect Park.